This can of compressed air is just the item you need if you're looking for a covert camera in electronic or industrial setting. 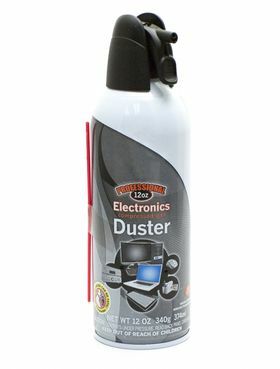 We take actual empty cans of compressed air and build our hidden cameras directly into them. Any work setting such as component construction or electronic work already contains compressed air used to dust off parts and clean areas, so this will fit in perfectly to that setting allowing you to keep an eye on that work space. They also have the added benefit of being permitted pretty much everywhere. There are 4 models available. - Support for up to 16GB of internal memory and a 10 hour battery life. - Support for up to 32GB of internal memory and a 10 hour battery life. - Support for up to 16GB of internal memory and a 30 hour battery life. - Support for up to 32GB of internal memory and a 30 hour battery life.